....tastes a little like spring and also like autumn, a delicious seasonal crossover! I've had a lovely orange wedge of organic pumpkin wedged into the corner of my crisper for nigh on two weeks now, alone and forgotten under a cluster of silverbeet. Upon discovering it, I made it feel oh-so-loved by hacking it into chunks, sliding one lot into the oven for use in salads, and steaming the other half for about 15 minutes, til smooshy and placing it back into the fridge to await its fate. This morning that fate was met. Chuck in a blender. Blend. My thermomix did the job in about a minute. 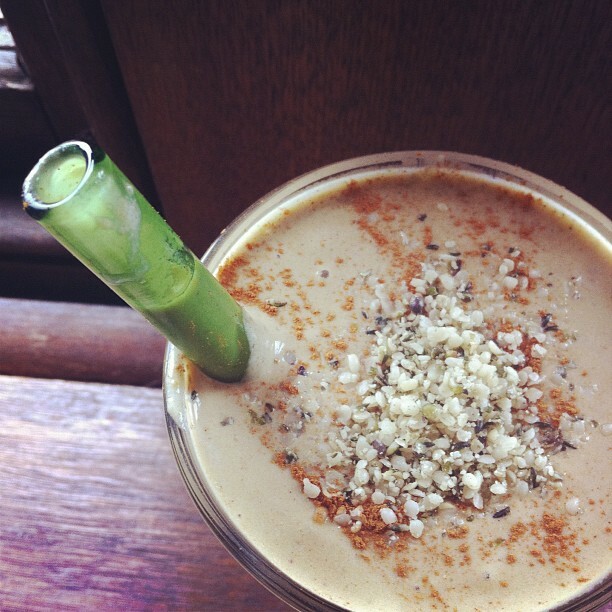 Pour into a glass and top with cinnamon and more hemp seeds. This was a great post-workout smoothie and a wonderful breakfast, whether you need to eat on the run or leisurely sit on the couch and share it with your dog (like I did). You can mix or match your berries and greens, and chuck in whatever other super-foods you have lying around. A good hit of protein, some lovely fats from the coconut and nuts, and the tahini, pumpkin and greens provide nice amounts of vitamins and minerals, such as your B's, vitamin C, betacarotene, calcium and potassium, amongst others. It was also kinda pleasant to drink a NON green smoothie for once - though I do adore my glasses of emerald goodness, it is nice to mix it up sometimes (and still sneak some cheeky greens in anyway!). What are your favourite non-green smoothie recipes? Looks healthy and delicious, and no doubt very filling - just the thing for after a workout!